Zinc, cadmium, and mercury make up one family of the periodic table. These three elements are representative metals possessing two valence electrons. Their position in the periodic classification immediately follows the transition series, and in keeping with the usual periodic trends, they have comparatively high electronegativity values for metallic elements and form bonds with non-metals of significant covalent character. The covalent properties are emphasized on going down the family from zinc to mercury. A common metal, zinc is released into the environment through mining and industrial operations. It is comparatively nontoxic, as suggested by USPHS maximum limits of 5.0 mg/liter in drinking water. Its simple compounds are readily hydrolyzed, while oxygen and nitrogen are the favored donor atoms. It is a constituent of enzymes—for example, carboxypeptidase A, which is active in the hydrolysis of a terminal peptide linkage of a peptide chain. The active site in this enzyme is a Zn(II) ion coordinated by two imidazole nitrogens and two oxygens from a bidentate carboxylate group from amino acid units in the protein portion of the enzyme, and a water molecule (Figure 10-14). The zinc can accept a bond from an oxygen in the substrate. The shift in electron distribution in the peptide resulting from this coordination facilitates the hydrolysis step.16 Stereochemistry and hydrogen-bonding interactions of the protein chain assist in this process. Carbonic anhydrase, which catalyzes the conversion of carbon dioxide to bicarbonate, is another zinc enzyme. In this, the zinc is in a 4-coordinate site involving three imidazole nitrogens and a water molecule. 16 The process is not simple. Coordination of the substrate may cause the carboxylate to change to unidentate coordination to maintain the coordination number. The coordinated water is depro-tonated to act as a hydroxyl group. Structures and mechanisms of zinc and other enzymes are discussed in S. J. Lippard and J. M. Berg, Principles of Bioinorganic Chemistry, University Science Books, Mill Valley, CA, 1994. FIGURE 10-14 The active site in the zinc enzyme carboxypeptidase A. The configuration of the protein chain that is important for the reaction is not shown. metal to Fe(II). The Fe(II) is further oxidized to Fe(III), which forms a porous coating of hydrated oxide, often increasing further corrosion. A more active metal in contact with the iron will be oxidized preferentially, serving to protect the latter. This is the case with zinc. In contrast to a protective coating of paint, which will permit corrosion to start in cracks or pinholes, an electrochemically protective process will function even if the coating is not intact. The zinc on galvanized iron is sacrificed as it performs its function. Cadmium, the second member of the zinc family, resembles zinc in its chemistry in many respects. Indeed, obtaining zinc free from a cadmium impurity is difficult. A major chemical difference is a tendency of cadmium to form more covalent bonding than does zinc, and more stable complexes. It is extremely toxic and a very hazardous heavy metal; kidney damage, and at high levels bone damage, are the main effects. Inhalation of vapors can lead to lung damage. Its limit in drinking water is 0.01 mg/liter. The reason for the high toxicity may in part lie in its similarity to zinc; it can replace the latter in enzymes, for example, but because of stronger bonding and perhaps stereo-chemical differences, the function of the enzyme is disrupted. It is cumulative; ingested cadmium remains in the body for many years, so that small but continued intakes can lead to significant body burdens over time. However, much of this cadmium appears to be bound irreversibly to thionein, a small sulfur-rich protein, the main function of which appears to be to tie up heavy metals as a protective mechanism. Evidence for a cadmium role in a marine plankton carbonic anhydrase enzyme, suggests that this may be another example of a toxic element that has an essential biological function. Fungicides Various compounds have limited use, mostly on golf courses from dissolution of the element from cadmium-plated utensils by acidic foods such as fruit juices. Cadmium sulfide and selenide are used in some red and orange paint pigments. Although these are very insoluble, this does not guarantee biochemical inertness, as it is well known that metals can be solubilized by bacterial attack on solid inorganic sulfides. While this process has not been reported for cadmium sulfide pigments, it does suggest the danger of assuming harmless behavior on the basis of in vitro chemical properties alone. Some uses of the element are summarized in Table 10-6. 17A rough translation is "ouch-ouch"; this is an extremely painful brittle bone disease. 18Jun Kobayashi, Pollution by cadmium and the itai-itai disease in Japan, in Toxicity of Heavy Metals in the Environment, Part I, F. W. Oehme, ed., p. 199. Dekker, New York, 1978. Also E. A. Laws, Aquatic Pollution, 2nd ed., p. 391. Wiley, New York, 1993.
weight. Mercury tends to be still more covalent in its bonding character than cadmium, especially with heavy elements such as sulfur, which coordinates very strongly with Hg(II), a soft Lewis acid (see Section 9.5.3). Indeed, mercuric compounds bind strongly to the amino acid sulfur atoms contained in many protein and enzyme structures, thereby disrupting their normal physiological processes. The Hg—C bond has comparatively low polarity and orga-nomercury compounds are quite stable in aqueous media, in contrast to the more polar organozinc and -cadmium compounds that are easily hydrolyzed. Another feature of mercury is its ability to exist in the Hg(I) state. This state is stable in solution over a very limited pE range, and under most circumstances would be important only as insoluble solid compounds or in the presence of elemental mercury. The elemental form is liquid at normal temperatures, with a significant vapor pressure. Because of its volatility, Hg is found universally at very low levels, and cycles through the atmosphere. The environmental chemistry of mercury depends on both organic and inorganic forms, which differ considerably in their toxic effects, although all are hazardous. The vapor from the elemental form has severe physiological effects if inhaled, since in this form it can be transported to the brain and enter brain cells, where it causes irreversible neurological problems. The long-term limit is a billionth of a gram (1 ng) per liter of air. This is easily exceeded in a closed room containing exposed mercury (e.g., a laboratory), although the rate of evaporation is usually slow, and reasonable ventilation will keep enclosed areas safe. Since the liquid metal is relatively inert, as are many of the insoluble inorganic mercury compounds, oral ingestion of the liquid metal (e.g., dental amalgams) is less hazardous. Nevertheless, concern has been raised about the release of mercury as the vapor from dental fillings, with suggestions that some individuals are sufficiently sensitive to mercury that they should have such fillings removed. It is generally considered that these concerns have no scientific basis. 19See J. Johnson, The mercury conundrum, Chem. Eng. News, p. 21, Feb. 5, 2001, for a discussion of current trends in use and marketing of mercury. Mercury batteries for cameras, etc. (now discontinued); additive to dry cells to improve performance (now replaced). Mercury vapor lights for street and commercial lighting, fluorescent and neon lights. Used in relays, thermostats, etc. Alloyed with gold or silver. (Uses in these categories are now generally restricted.) Agricultural use, especially on seed grain. Especially in pulp and paper mills. Especially as topical skin treatments. Often as mixed Hg-Cd-S-Se compounds. As metal; amalgamation method for separating gold. Metallic electrode material. Mercury compounds as catalysts (especially acetaldehyde, vinyl chloride synthesis). Coal contains some mercury, which is released on combustion; oil releases a very small amount. Municipal and other incinerators release Hg from waste. A considerable amount of mercury is released to the atmosphere in natural processes from the soil and through plant transpiration. 1 J. Johnson, Chem. Eng. News, 21, February 5, 2001. 20S. C. Gwynne, The quicksilver mess, Time, Jan. 26, 1998.
when teenagers found a large amount of mercury metal in an abandoned neon light factory and, being unaware of its hazards, treated it as a toy—even dipping cigarettes in it before smoking them. Several people were hospitalized as a result of exposure, and a number of homes and other buildings were contaminated as the finders distributed the mercury to friends. There is also concern about the use of mercury in religious rituals by people of some Caribbean and Latin American areas, where mercury-containing candles are burned and other mercury-containing materials that can release the vapor are employed. The natural volatility of elemental mercury means that there is a mercury cycle in the environment. Mercury ore deposits normally produce a considerable mercury vapor pressure that results in a low level, worldwide distribution of mercury, and recent studies have shown mercury vapor release from plants and soils far from mercury contamination sites.21 The element has been found in ice samples that predate industrial use of the metal. Atmospheric release from anthropogenic sources is of some concern; the U.S. EPA is planning to require reduction of mercury release from power plants.22 Coal-burning power plants in the United States release about 50 tons (33% of the total U.S. release; 1995 figures) of mercury per year to the atmosphere, mostly as elemental mercury from low-sulfur coals and as Hg(II) compounds from high-sulfur coals. In the latter case, existing scrubbers are effective in removing much of the mercury from the exhaust gas before it is released to the atmosphere. With elemental mercury, however, additional treatment is required. 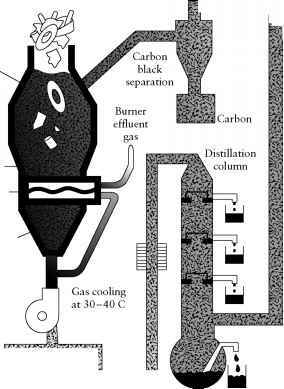 This can include addition of activated carbon to absorb the mercury before the dust collectors, or use of an oxidizing agent in a wet scrubbing system. Since the mercury concentrations are the order of 1 —10 ^g/m3 in a gas flow of as much as a million ft3/min in a 250-MW plant, mercury removal is both technically challenging and expensive. Industrial boilers in the United States contribute another 28 tons (18%) to the atmosphere annually. Other anthropogenic sources of release to the atmosphere are incinerators: 30 tons (18%) from municipal waste incinerators, 16 tons (10%) from medical waste, and 7 tons (4.4%) from hazardous waste incinerators. Regulations are already in place to limit this release. Industrial sources, mainly cement and chlor-alkali plants, contribute another 10%. 22J. Johnson, Chem. Eng. News, p. 18, Jan. 1, 2001.
early symptoms of mercury poisoning from the use of a Mexican beauty creme that contained calomel. Organomercury compounds are much more toxic; as early as 1870, several chemists had been killed or permanently injured from working with the then new compounds of methyl- or ethyl-mercury.23 These compounds are lipid soluble, and since higher organisms do not decompose and excrete them effectively, small amounts in the environment tend to be concentrated in organic tissues in the food chain. Two general classes need to be considered: organo-mercurium cations, RHg+, which form ionic bonds to anions such as nitrate or more covalent ones to softer anions such as chloride, and species with two organic groups, R2Hg. These compounds, especially dimethylmercury, are readily transferred into cells and even through the placental barrier to the fetus. Both forms can be found in water systems, as discussed shortly, and are concentrated in biological materials. Besides originating from natural sources, mercury pollution may come from organomercurials (e.g., methyl, ethyl, and phenyl compounds) used as fungicides in the treatment of seed grains, and from industrial discharges of orga-nomercurials (e.g., phenyl mercuric acetate fungicides from pulp and paper mills), from inorganic mercury compounds, or from the metal. In North America, large amounts of the metallic mercury were discharged from chloralkali plants in which mercury cathodes were used in the electrolysis of NaCl solutions in the productions of Cl2 and NaOH. Such inorganic mercury discharges were long considered to be inert and harmless. Unfortunately, bacterial action can convert inorganic mercury in sediments to soluble methyl-mercury and dimethylmercury species. Conversion to diaphragm-type cells to eliminate mercury release has largely overcome this source of pollution. The inorganic forms of mercury undergo interconversions mediated by microorganisms; for example, insoluble HgS is converted to soluble Hg(II) by bacterial oxidation, and soluble Hg(II) is reduced by some bacterial enzymes to Hg(0). This forms a process by which mercury can be eliminated from the bacterium through volatilization. If Hg(II) and Hg(0) are present together under appropriate conditions, they will enter into an equilibrium reaction to produce Hg(I); the latter exists as the diatomic ion Hg2+. 23In 1997 a research chemist died as a result of the spill of a few drops of dimethylmercury, which penetrated her latex gloves and were absorbed through the skin. by H2O. The cobalt is oxidized from the unusual Co(I) state to the more common Co(II) state in this process. The methylmercurium ion CH3Hg+ can be further methylated to (CH3)2Hg in a similar process. The actual product that predominates depends on the pH of the medium, because the dimethyl compound decomposes to the more stable monomethyl derivative in slightly acidic solution. 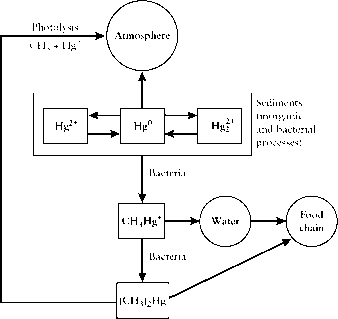 Methylmercury compounds also can be reduced bacterially to Hg(0). There also is evidence that Hg(II) can be methylated by water-soluble methylsilicon, methyltin, and methyllead compounds if these should be introduced from industrial wastes. FIGURE 10-15 The mercury cycle. reason it is recommended that swordfish not be eaten more frequently than once per week, or once per month by women who could become pregnant because of the added risk to neural development of the fetus. The mechanism of formation of methylmercury in the environment is applicable to other elements (e.g., tin, palladium, platinum, thallium) that are heavy metals that form covalent, relatively nonpolar metal-carbon bonds. Some of these elements are employed industrially and could be discharged in wastes. Thallium in particular is toxic in its inorganic as well as organic forms, and it bears other resemblances to mercury in its behavior. On the other hand, the more electropositive metals including zinc, cadmium, and lead are not methylated this way (at least, not to any significant extent), and their alkyls are not stable in aqueous solution. 24E. A. Laws, Aquatic Pollution: An Introductory Text, 2nd ed., Wiley, New York, 1993, p. 372.
major incidents of poisoning have been confirmed, health effects have been found in communities that make heavy use of freshwater fish from contaminated water in their diets; examples are people of northern Ontario, northern Quebec, and peoples living along rivers in the Amazon Basin of Brazil.